Firing up the grill on a boat is as common place in the boating world as it is for back yard grilling gurus. The method is the same, the recipes are the same, and the end results can be the same as well! The only real difference is that grills designed for boats are generally smaller in size when compared to landlocked versions. If you need help, check out my reviews of the best pontoon boat bbq grills. When it comes to pontoon grill ideas, or grilling on a boat of any size, is scaling the recipe and portion sizes to the size of your grill. Let’s face it – unless you have a larger houseboat with the deck space for a full-sized grill, your boat grill is probably geared towards small portion cooking. You are not going to smoke a rack of ribs! But why not a great steak or fresh seafood? To help along the grilling on a boat idea process I thinkthat a few simple recipes are in order. These recipes are based on easy grilling with lots of flavor using common ingredients and saving space. And, I’m a big believer in pre-prep work! It’s a natural thing when cooking or grilling on a boat. Let’s start with something really simple! Here’s a great tip when it comes to grilling on a boat. Do as much prep work at home before you head to the boat! This recipe uses two ingredients with a whole bunch of chicken wings and drummies. I like to give these wings an overnight soak in the easy marinade. Put the chicken wings in a heavy duty zip close bag, a large one, and add in the sauce and dressing. Roll the wings around to mix and evenly coat. Place in the fridge the day before the boat trip turning a few times to evenly coat. I’ve even double bagged the wings, frozen them, and allowed them to thaw naturally in a cooler on the boat until needed. Grill the wings over medium high heat turning often until juices flow clear. The key is to turn, and turn, and turn, until golden brown. Or, use a grilling basket that fits your grill. Turn the basket and rotate as needed. Add in a dash of hot sauce in your mix as well for a bit of heat if desired. If you’re going to take sliced tomatoes, cheese, lettuce, and condiments on your boat for deli meat sandwiches then why not consider upping the game with the easy to prepare Grilled Cajun Grouper Hoagies?Go ahead and make the sauce beforehand or purchase your favorite brand. You can season the fillets with lemon juice and the spices properly store, cover, and chill, before grilling. Combine all of the ingredients in a bowl and chill before serving. Adjust hot sauce and horseradish to desired levels. Drizzle the fillets with lemon juice and sprinkle evenly with Cajun seasoning and a few dashes of seafood seasoning. Use Creole seasoning for less heat if desired. Grill using a non-stick or prepared grilling basket for easy turning. Grill over medium high heat turning once or twice. Grill 4-5 minutes per side checking for doneness. Grilling time will vary depending on fillet thickness. You can also use foil with non-stick spray as a perfect grilling surface. Grilling the hoagie buns for a few minutes to add some grill marks if desired. Serve hot – with your choice of lettuce, tomato, onion, and more topped with some of the sauce. I can’t let a grilling article go by without including a steak! This recipe is amazing easy and only requires a few ingredients. The kicker is the flavored butter that tops the steak off! Evenly coat the ribeye steaks with a small amount of olive oil. Wait about five or ten minutes then coat evenly with your favorite steak marinade. Store in a zip close heavy duty freezer bag chilled until ready to grill. An overnight soak in the easy marinade really pays off! In a bowl, combine the butter, steak sauce, and honey. Spoon the butter into a Tupperware type of container and chill to set. Grill the steaks over medium high heat for about 4 minutes per side. Turn once while rotating to ensure even cooking. Grilling time will vary depending on steak thickness. 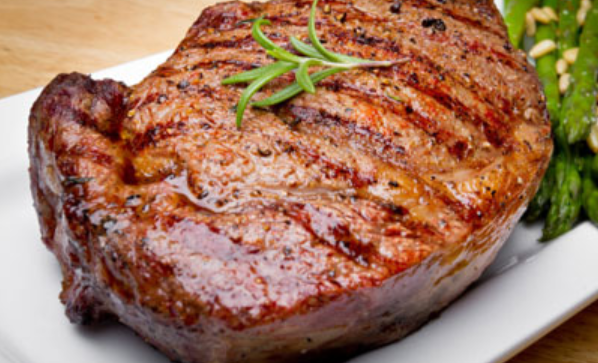 Remove the steaks from the grill, plate, top them with butter while resting for a few minutes. I suggest selecting a grill that best fits your needs for grilling on a boat. Take into consideration size, your actual needs, how you will fit and store the grill, and of course cost. But, when it comes to firing up a grill on your boat you should always be sure that you have working fire extinguishers, proper tools such as hot pads for moving hot items and working with hot lids. You should also follow basic safe cooking guidelines. Cold food should be kept cold, hands should be washed, cooking areas and utensils properly cleaned. It’s amazing what cleaning wipes and spray cleaners can do! Grills designed for use on a boat most often have covers which are more than just a lid! The covers also act as wind blocks. I find that smaller grilling baskets are perfect for handling everything from hotdogs and bratwurst to seafood, steaks, chicken, and burgers. Why worry about things moving or rolling around in the likely event that a wake from an un-courteous boater hits you? I love grilling on our houseboat project. Thankfully we a decent sized galley and fridge space. But, as I suggest in the recipes and article above – take advantage of as much prep work that you can at the house. This is a grilling rule I have for boat grilling as well as tailgating races or football games. It just makes things easier. Just because it’s generally a small grill and recipes using easy methods and limited ingredients does not mean you can’t grill up a tasty meal on the water! Bio: Kent Whitaker – also known as the Deck Chef – is a Tennessee based cookbook and culinary writer with a family passion for boating. The former winner of the Emeril Live Food Network Barbecue Contest is also a member of the United States Coast Guard Auxiliary serving as a trainer for USCG Auxiliary Food Service Specialists.